It tastes great and goes well with a soup or stew. Perfect for those St Patrick’s day celebrations! Mix the soy milk and lemon juice in a jug and let sit for 5 minutes. This will curdle and thicken the soy milk as a vegan buttermilk substitute. Mix all of the dry ingredients until well combined. Add the soy milk mixture and stir through until well combined. Slightly wet your hands and work the dough lightly with your hands to make sure it all combines. Place the dough onto a baking tray lines with non-stick parchment paper. Bake for 45 minutes in the centre of the oven. Tap the loaf on the underside of the bread to make sure that it is cooked. It will sounds hollow when you knock on it. Can i use brown rice flour instead of whole wheat? Or any o the GF flour? Did you use the metric or imperial measurements? It sounds like something went wrong in the conversions. The teaspoons I use are 5ml and tablespoons are 20ml. My cup size is 250ml. Thank you for this! My husband grew up in Ireland and I know he’ll be wanting this. What is the instant oats measurement? I see the 4 Tablespoons but I’m not clear on the 17/75. I’m not sure why it converts it like that. I will get out tech guy to look at it. Just put 4 1/2 tablespoons. How many cups of flour? The conversions are unclear to me. I made this bread for supper along with a vegetable soup for St Patty’s Day last night. Wow, it was delicious. We dipped the bread in the soup. Sorry, I didn’t take a picture. I was just too hungry by suppertime. It was such a treat since I don’t eat bread that often. Thanks again, Anja, for another great recipe. Next time I’ll take a picture. I made this for St Paddy’s Day dinner with a beef less stew, colcannon and broccoli. I made it at lunch time so we had it cold. It was quite dense and heavy but still went well with the stew. It had an earthy flavour. I tried it again the next day but had gave it a quick burst in the microwave. Lovely bread, I have made it 3 times now. I use organic flour and the first time the mixture was too dry. I added another 50ml of milk the 2nd time and this last loaf an extra 100ml of fluid. Not sure how that relates to cups but the last loaf is perfect. Approx. 4 cups… but I prefer to weigh it when it comes to baking. I made exactly as per recipie but the bread is hard as the rock, don’t understand why.. It sounds like you needed more liquid or it cooked too long/hot. I really love your videos! I tried this and mine also was hard like a rock. I used gluten free 1 to 1 flour and weighed out exactly 500 grams but quickly discovered that 250 ml of plant based milk was not nearly enough to turn the dry ingredients into a dough. At that point I had no other choice but to add more milk. Is it possible that the gluten free flour weighs less than regular flour? Just looking at your video, there was a lot more flour in my bowl than there was in yours. 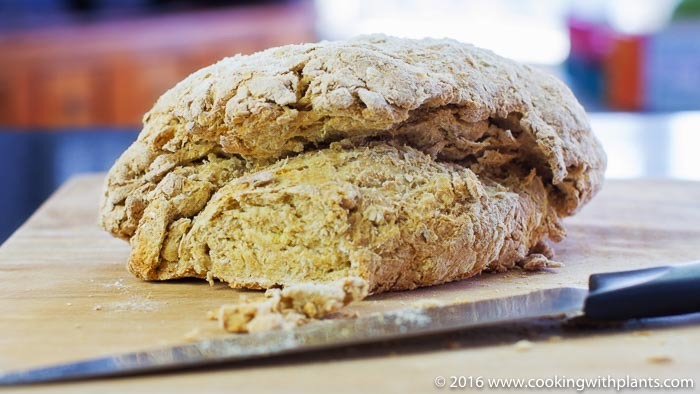 I would love to find a simple easy gluten free plant based bread that is easy to make. Made this this morning and had some for lunch. It’s delicious. I used far-free soy. Anyone added anything else like herbs, spices, garlic, etc? Thanks for the recipe, Anja. I used unbleached flour (4 cups plus 2 tbsp )and almond milk (350mL). It baked for 40 minutes. It turned out perfectly : golden brown and hollow sounding. Hi Anja, this sounds great!Could you please check, though, there are cups in the metric units, eg for the soy milk, what’s that in ml? Thanks! Maybe mix it with some rice or sirghum flour to lighten it up.